THE MAUKU AND Patumahoe districts, contiguous to Pukekohe and extending to the southern tidal waters of the Manukau Harbour, are attractive to-day with the twin charms of natural landscape beauty and the improvements made by the farmers’ hands during more than sixty years of settlement. Even before the Waikato War the Mauku, first settled in 1856, was a fairly-well-peopled locality, when the site of the present Town of Pukekohe was still a forest of puriri and rimu. The branch railway-line from Pukekohe to Waiuku passes within a short distance of the pretty, antique-featured building upon which the war-history of Mauku is centred. The Church of St. Bride’s is of an eye-pleasing design that belongs to many of the churches planted by the pioneers, whose first care, after establishing their homes, was to set up a place of worship in their midst. 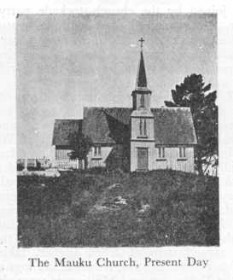 Built of totara, its shingled roof dark with age, its spire lifting above the tree-tops, it stands picture-like on a green knoll in the midst of its little churchyard. Walk round its walls and count the rifle loopholes in its sides—narrow slits that remined one that the place was once a fort as well as a church. There are fifty-four of those rifle-slits, now neatly plugged with timber or covered with tin and painted over. The cruciform design of the building exactly lent itself to fortification, and gave the defenders the necessary flanking bastions. When the Mauku men erected their stockade of split logs, small whole tree-trunks and heavy slabs, 10 feet high, they planted the timbers alongside one another close up against the walls of the buildings. The openings for rifle-fire were cut through walls and stockade; the garrison therefore could point their long Enfields through the double defence. These loopholes, at regular intervals all round the church, at about 5 feet from the floor, are 9 inches in length vertically by about 3 inches in width; the cuts in the palisade were necessarily a little wider to give the rifles play. At the tidal river-landing, about a mile distant to the west, stood the Mauku stockade, a small iron-roofed structure defended by a wall of upright logs. This stood at the spot where cutters from Onehunga landed stores for the local forces. The first alarm of a racial war occurred in October, 1860, when a Maori of the Ngati-Tamaoho Tribe named Eriata was found shot dead in the bush at Patumahoe. The natives imagined he had been murdered by a European, and a war-party of Waikato and Ngati-Haua came down in canoes to Te Purapura to investigate the matter. Wiremu Tamehana accompanied them to exercise a restraining influence, for the chiefs of the war-party had declared that if it were true that a pakeha had killed the Maori they would begin a war. Possibly war would have been precipitated but for the intervention of Bishop Selwyn and Archdeacon Maunsell, who met Tamehana and the taua and persuaded the force to return. Mr. Donald McLean and Mr. Rogan, of the Native Department, also went to investigate the matter and met the Patumahoe people. The conclusion arrived at was that the Maori had accidentally shot himself. It was Mr. Daniel H. Lusk (afterwards Major Lusk), a surveyor by profession—he had helped to lay out the City of Christchurch in 1851—and owner of a bush farm in the district, who was chiefly instrumental in forming the Forest Rifle Volunteers. Mr. Lusk had been in New Zealand since 1849; he was a frontiersman of the best kind, energetic and observant, used to the bush, and endowed with a natural gift of leadership. To him more than to any other settler-soldier the credit was due of placing the district west of the Great South Road in a state of defence. He had organized local Volunteer crops during the first Taranaki War. When that campaign ended in returned to store. 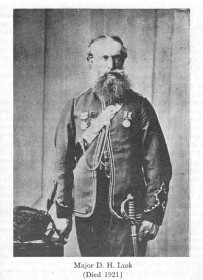 However, Mr. Lusk was firmly of opinion 1861 many settlers imagined that fighting had definitely ceased in New Zealand, and most of the rifles at the Mauku were that there would be war in the Auckland District, and early in 1863 he was the principal means of forming three companies of Forest Rifles—one at Mauku, one at Waiuku, and one at Pukekohe East. The first skirmish in which the Forest Rifles were engaged was fought on the 8th September—the morning after the encounter near Camerontown in which Captain Swift, of the 65th, was killed. Early that morning, a small body of colonial troops, consisting of about thirty-five of the Forest Rangers, under Lieutenant Jackson and Ensigns Von Tempsky and J. C. Hay, and fifteen of the Mauku Company of Forest Rifles, under Lieutenant Lusk, started out from the Mauku stockade on a bush-scouting expedition in search of Maoris. They began by reconnoitring the forest and the bush-clearings in the direction of Patumahoe and Pukekohe. The tent encampment is that of the right wing of the Movable Column, usually called the Flying Column, consisting of Imperial troops and Militia, engaged in patrol duty on the flanks of the Great South Road. They reached the farms of Lusk and H. Hill, between Patumahoe and Pukekohe Hill, and found that the Maori marauders had been there. Lusk’s house had been pillaged. On the edge of what was known as the “Big Clearing,” belonging to Mr. Hill, they found traces of the raiders. The Maoris shot a bullock in this clearing, which was nearly half a mile square, covered with burnt stumps and logs. The force, hearing the shots, divided, and twenty, under Jackson, Lusk, and Von Tempsky, scouted about the fringes of the paddock, keeping under cover of the bush. They received a sudden volley at a range of a few yards, and replied briskly. The natives were sheltered behind masses of fallen trees and undergrowth interlaced with supplejack. The other party of Rangers skirmished up on Jackson’s left and joined their comrades. At last the Maori fire grew slacker, and the Rangers and Mauku Rifles charged into the bush, but their opponents had disappeared. An encampment was found with about a dozen rough huts. Only fleeting glimpses of the Maoris had been obtained during the skirmishing, and any killed or wounded were carried off the field. It was reported afterwards that five had been killed. The war-party was composed chiefly of Patumahoe natives, the Ngati-Tamaoho and other hapus, who, after deserting their settlements, were prowling about the bush, plundering the outlying homesteads. The European force suffered no casualties, although several of the men had received bullets through cap or clothes. It was the maiden fight of the Rangers and Mauku Rifles. The guerilla veteran Von Tempsky in his journal gave high praise to some of the settler-soldiers. Lusk he described as “a man of consummate judgment about Maori warfare.” In the height of the skirmish he found time to admire the sang froid of the Mauku men: “There are some cool hands amongst those Mauku Rifles. There are big Wheeler and little Wheeler, and Kelahan, watching the Maoris like cats; they have holes through their coats, but none through their skins as yet. Lusk is cool and collected, keeping the men together.” The best marksmen were Jackson and Hay, both crack shots. This was one of the first fights in the war conducted after the traditional manner of North American Indian warfare, skirmishing from tree to tree. For some time after this skirmish the Forest Rangers remained at Mauku, making the fortified church their headquarters and scouring the bush. Less than a mile south of the Mauku church and village is a gently rounded hill of red volcanic tufa, crowned by a farm-homestead and crossed by a road. In 1863 this hill, known as the Titi, was a partly cleared farm belonging to Mr. Wheeler. Beyond, on the southern side, the land slopes deeply to a valley, on the farther side of which, nearly a mile distant, are the heights known as the Bald Hills. The distance of the Titi from the nearest part of the Waikato River is about six miles; the intervening country in the war-days was mostly dense forest, threaded by one or two narrow tracks—old Maori fighting-trails. Early on the morning of the 23rd October, 1863, the sound of heavy firing in the direction of the Bald Hills was heard by the little garrison of Forest Rifles and Militia at the Mauku church stockade and the lower stockade near the landing. 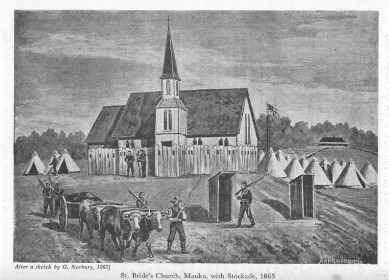 Lieutenant Lusk, commanding the Forest Rifles, was at the lower stockade at the time, and, thinking that possibly the church was being attacked, he advanced quickly with twenty-five men to St. Bride’s to reinforce the force there. Then it was thought that the volleys in the distance might be the Waiuku Volunteers out practising, and Mr. John Wheeler and a comrade scouted up through the bush and the clearing to reconnoitre. They discovered Maoris shooting cattle on Wheeler’s Farm, between the Titi summit and the Bald Hills. 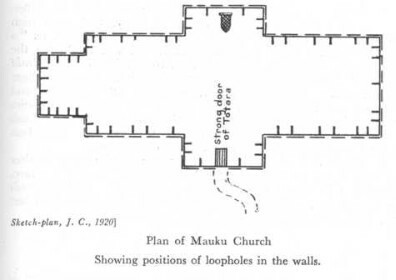 When Lieutenant Lusk received this report he despatched a man to the lower stockade, instructing Lieutenant J. S. Perceval, who had been left in charge of the Militia (1st Waikato Regiment), to join him at once at the church with half his force. At the same time one of the settler Volunteers, Mr. Heywood Crispe, was sent off to Drury for reinforcements. Lieutenant Perceval set out as ordered, at the head of twelve men, but instead of following instructions to join the others at the church he struck off to the right for the crown of the Titi Hill, with the object of taking the Maoris in the rear. These rash tactics quickly involved Perceval and his small party in a perilous position from which it was necessary for Lusk to extricate them. Perceval entered the bush, but the natives, having ended their cattle-shooting, came skirmishing over the hill and almost surrounded the Militia. The fight was now visible from the church stockade, where Lusk had been waiting for Perceval to join him, and in a few moments the Forest Rifles were dashing up the rise towards Wheeler’s Clearing. Perceval when joined by the church-stockade party was retiring in good order, hotly pressed, but without casualties so far. At this time Lieutenant Norman, a Militia officer who was in charge of the church garrison, and who had ridden into Drury for the men’s pay, returned and, armed with a rifle, caught up to the fighters on the hill. Lieutenant Lusk, considering his force of about fifty was strong enough to drive back the Maoris and enable him to return, now boldly attacked, and before the steady advance with fixed bayonets the raiders fell back through a strip of Wheeler’s felled but unburned bush to the open ground. The Maoris, however, skirmished rapidly through the standing puriri and rata forest on Lusk’s left flank, and as they greatly outnumbered the riflemen it was necessary to retire in order to avoid being outflanked and surrounded. The Kingites were endeavouring to cut the little force off from the church stockade, and Lusk had need of all his bush-fighting skill to counter their tactics. When recrossing this ragged strip of felled timber, taking advantage of every bit of cover and fighting from behind logs and stumps as they fell back, the Volunteers and Militiamen were charged fiercely by the warriors in their full strength, about a hundred and fifty. Now came a desperate close-quarters battle, lasting ten minutes or a quarter of an hour. At very short range—Lieutenant Lusk afterwards stated it at 20 yards—the opposing forces poured bullets into each other as fast as they could load and fire. Every log and every stump and pile of branches was contested. In the centre, facing the Maoris’ front, the gallant Perceval recklessly exposed himself, and it was with difficulty that the Mellsop brothers, three young settlers, prevented him from charging at the enemy. Twice they saved his life by pulling him under cover. At last, after shooting several of his nearest opponents, he was shot himself, and fell dead in front of his men. Lieutenant Norman was also shot dead, and several other men fell. Some of the Maoris, throwing down their guns, charged upon the bayonets with their long-handled tomahawks. Lusk, finding himself outflanked on both sides, ordered his men to take cover in the bush on the right. In this movement the troops had to run the gauntlet of a heavy cross-fire, and man after man was hit. One of the Forest Rifles, Private Worthington, was tomahawked as he was reloading his rifle; another man was killed with the tomahawk while he was in the act of recovering his bayonet which he had driven through a Maori’s body. One of the wounded, Johnstone, was assisted by two comrades into the bush, and as he could not walk he was concealed in a hollow rata tree, where he huddled until the relief force rescued him on the following day. After his active service in command of the Forest Rifles, Major Lusk joined General Cameron’s army in the Upper Waikato as an officer attached to the Transport Corps. When the steamer “Avon” sank in the Waipa River with her cargo of supplies (February, 1864) he succeeded in getting commissariat through to the troops at Te Rore with a Militia force, by rapidly cutting a pack-track from Raglan Harbour over the ranges to the Waipa, and kept the army supplied in this way till the “Avon” was replaced. Under cover of the bush Lusk’s force had a short breathing-space, and their accurate shooting soon cleared the smoky clearing of the Maoris, but it was impossible to venture into the open space to carry off the eight dead who lay there. The officer in command re-formed his men and retired in good order upon the church stockade, keeping carefully to the timber cover most of the way. This rearguard action, firing by sections as the retirement was made, was carried out with excellent judgment, and the little force behaved with the steadiness and coolness of veterans. The headquarters at the stockade and the post at the church were reached without further casualty. The force lost two officers and six men killed; but grief at the fall of good comrades and at the necessity of leaving their bodies to the tomahawk was tempered with the satisfaction of having killed or wounded several times that number of the enemy. Lusk and his comrades during the fight had cast many an anxious glance towards the village in the direction of the church stockade, hoping for the reinforcements from Drury. But when the long-awaited troops at last arrived all was over, and the battle-grimed Volunteers and Militia were back in their quarters. Heywood Crispe, who had galloped the twelve miles to Drury in three-quarters of an hour, had an exasperating interview with the Imperial officers at the camp. “Colonel Chapman was in charge there,” narrated Mr. Crispe, “and with him was young Colonel Havelock (Sir Henry Havelock, son of the Indian Mutiny hero), who was on General Cameron’s staff. I told them that I had seen the Maoris shooting cattle, and they almost laughed me to scorn, and said it was impossible for natives to be there. I most earnestly solicited them to send for Major Rutherford’s ‘Flying Column,’ which I knew was in camp at the Bluff near Pokeno, and get the force to go through Tuakau and on to Purapura, on the Waikato, where they would be sure to intercept the Maoris returning from Mauku, as it was their only way of retreat to cross the Waikato.” Crispe also begged for mounted men, some of the Defence Force Cavalry, to be hurried off to the Mauku, but all that was done was to send two companies of infantry—the Waikato Militia—who arrived there in the evening, too late to be of any use. Early next morning firing was heard in the direction of the Bald Hills, and some natives were seen there, but when a force of about two hundred men advanced to the Titi Farm the Kingites had disappeared. It was learned afterwards that these Maoris were some who had met the returning war-party on the Waikato River, and, on hearing that they had not fired a volley over the battle-ground after the battle by way of claiming the victory, had marched in themselves and fired off their guns near the spot. The troops found the bodies of the slain men all tomahawked and stripped of arms and equipment and part of their clothes, laid out side by side on the grass in the clearing. A pole on which a white haversack had been tied indicated the place. The bodies, with the exception of Worthington’s, which was buried at Mauku, were sent in to Drury for burial. A force was sent through the bush to Purapura, following the trail of the Maoris, and numbers of kauhoa or rough bush-stretchers for carrying the dead and wounded were found. It was estimated that the natives had lost between twenty and thirty killed, besides many wounded. The “Flying Column” had in the meantime marched across country via Tuakau to intercept some of the raiders, but they only reached Rangipokia, near Purapura, in time to open fire on the last of the canoes crossing the river. The Maoris returned to Pukekawa, the field headquarters of Ngati-Maniapoto.